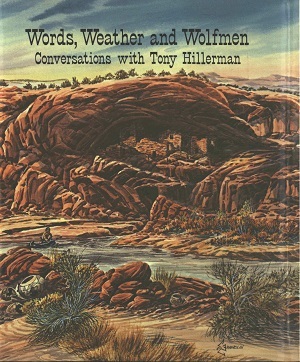 This is the hardcover limited edition of Words, Weather and Wolfmen: Conversation with Tony Hillerman, published by The Southwesterner Books in Gallup, New Mexico. The volume contains an interview with Tony Hillerman by Ernie Bulow, an autobiographical essay by Hillerman entitled "Mystery, Country Boys and the Big Reservation," a Jim Chee short story called "The Witch, Yazzie and the Nine of Clubs," and twenty-six illustrations by Ernest Franklin. The volume was edited by Ernie Bulow and Ernest Franklin's illsutrations were inspired by A Thief of Time. Inserted after the front fly leaf is a page that contains the text, "400 copies of Words, Weather and Wolfmen have been printed 350 copies have been signed and numbered. 26 specially bound copies which include an original pen and ink drawing have been signed and lettered A to Z. This copy is" There are then spaces for the number or letter of the copy and for the authors' and illustrator's signatures. Format: Hardback, 22 x 17.3 cm. Binding: Four different bindings were used for this volume. Light leather colored boards with the title printed in gold on the spine, dark leather colored boards with a decorative device on the front cover and the title printed in gold on the spine, darker leather colored boards with a decorative device on the front cover and the title printed in gold on the spine and light greenish-yellow colored boards with the title printed in gold on a dark leather colored spine.